The Modern Quilt Guild I belong to has a Block of the Month and in February we were asked to make this wonky pinwheels block created by Natalie at greenleafgoods. If you like it, jump over the tutorial and stitch one up! 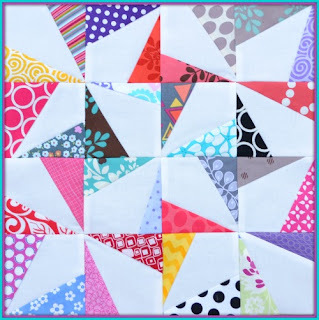 This is a wonderful block for scrap busting and once you cut out your neutral (or any color really) base squares, you do those scraps, press and sew! I do suggest you press opposite to the side for the rows though, you know....that nesting thing that sounds odd, but actually when you follow it - works! Hope you have a wonderful day today and if you are headed to Quiltcon, have fun - I'll see you soon! Pretty block! I agree with the nesting--I'm a strong supporter of it! I don't think I'd ever match a block if I didn't do it. I love this! I have just the right scraps for a quilt size of this pattern. Thanks. 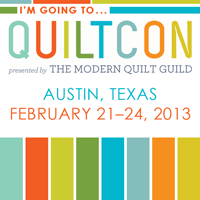 Enjoy Quiltcon. What a wonderful block. I really love it!